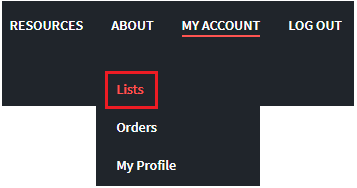 View which lists are included on an order. Determine if dollars remain on the purchase order. You may need to submit more titles. Print a list of titles within a status type. To check on the status of your order, log into Mackin.com and choose My Account > Orders. District administrators can view the status of orders for multiple locations. If you are in charge of more than one school, simply choose the desired school from the dropdown menu next to Location Name. 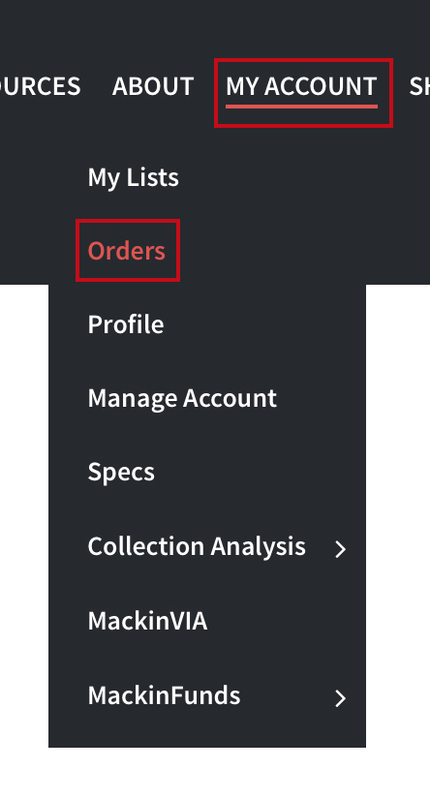 You can choose to display all orders, or you can filter by Open or Closed orders. From the dropdown menu, choose the year in which your order was placed, then click Find. Click the View Order Status link next to the order you want to view. From the Status of Titles dropdown menu, you can filter the grid view of your titles by items Shipped to Date, Titles to Be Processed, items Ordered, Not Yet Received, and titles that are Out of Print/Out of Stock Indefinitely. Your order history can be found by logging into Mackin.com and going to My Account > Orders. Before you order through Mackin, you will need to create a list of items to purchase. We recommend over-ordering by 20% and prioritizing titles to make sure we use the entire amount specified on your dollar limit. Select the name of the desired list and click the Order Now button. You will be prompted to complete your transaction using our online ordering process. 1. Review the information in the Order Info section. 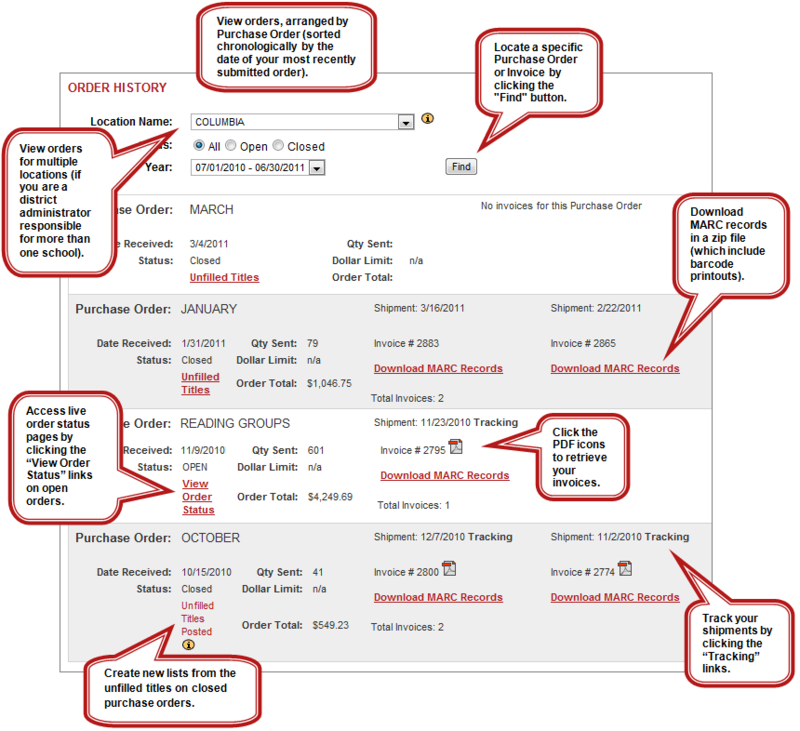 Select the order description and whether you want Mackin to catalog and process your order. Click Shipping/Billing to proceed to the next step. 2. 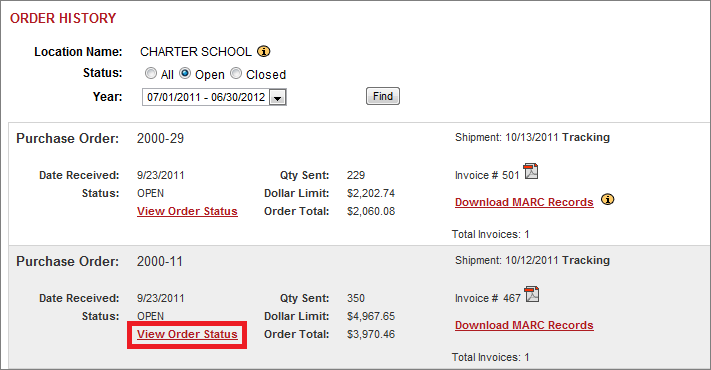 Provide the school name, confirmation email, and shipping and billing information in the Shipping/Billing section. Click Payment to proceed to the next step. 3. Choose your payment method in the Payment section. 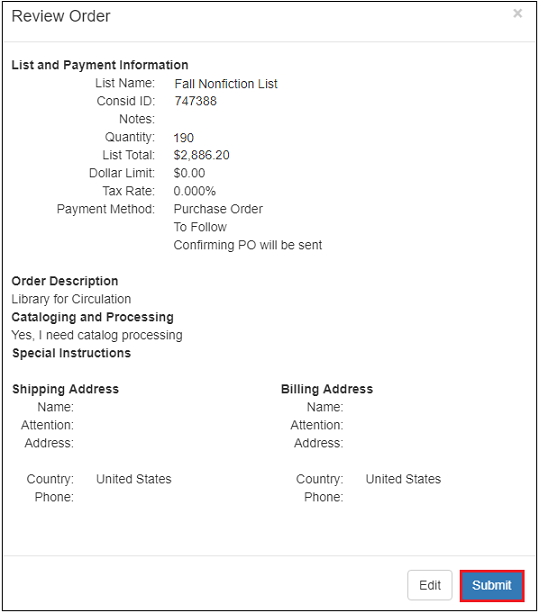 If you select Purchase Order, enter either the Purchase Order number or “To Follow”. 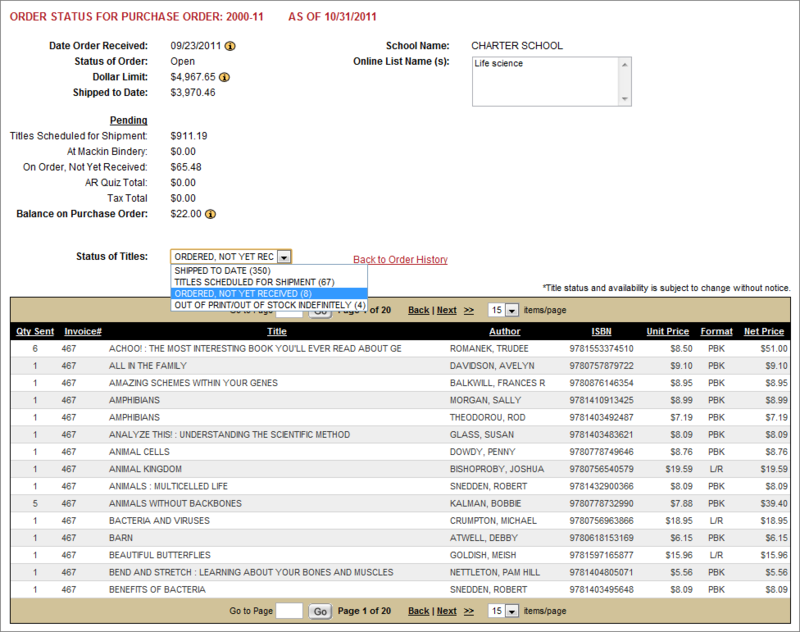 Additionally, note if a copy of the Purchase Order will be sent to Mackin later. 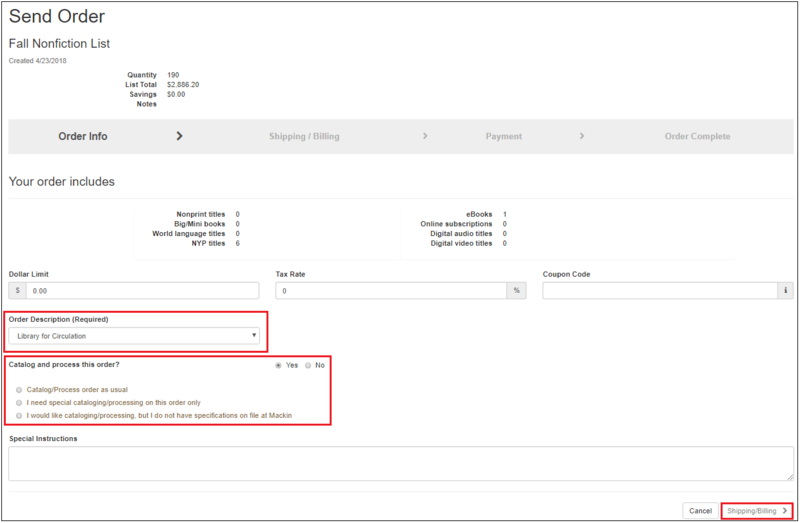 If you select credit card, your card will be charged at the time of each shipment by default. Click Review to proceed to the next step. 4. Confirm your order information in the Review section and click Submit to complete the transaction. If questions arise about your order, you will be notified immediately by Mackin Customer Service. Mackin does not require a Purchase Order. However, if one is not provided, we will need the billing and shipping address to process the order. 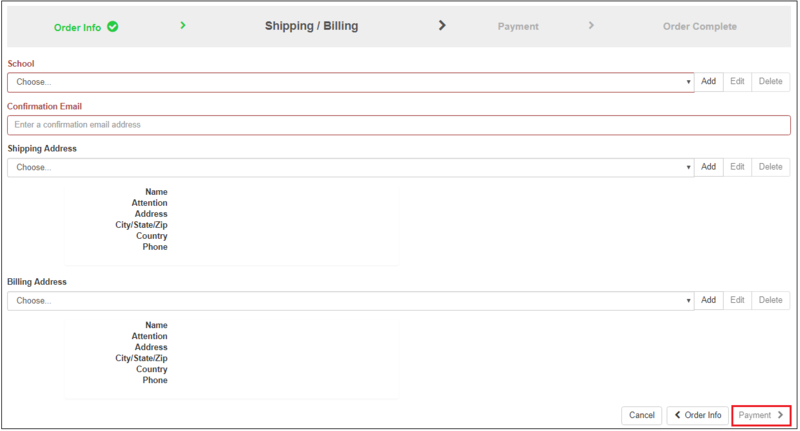 If you indicate that a PO is coming, we will not ship materials until the PO is received.